Your Local Asset Management Community of Practice in BC. Enhancing BC communities through leadership in asset management. The Framework establishes a high-level, systematic approach that supports local governments in moving toward service, asset and financial sustainability through an asset management approach. The development of the Framework was led by the Union of British Columbia Municipalities in partnership with Asset Management BC. • Feature Article: Congratulations, you have been elected, now what? Mark November 6 – 7th, 2019 on your calendar for the 2019 Asset Management BC Annual Conference, at the Radisson Hotel – Vancouver Airport. Learn about practical approaches and solutions for implementing asset management in your community. Additional Conference details such as registration, speakers, etc. will be updated when available. Public Sector Digest (PSD) is seeking municipalities interested in participating in a pilot initiative, rolling out the UKCIP climate change adaptation wizard in Canada. Your municipality will work with PSD and Dr. Peter Walton from Oxford University to introduce the climate change adaptation wizard to your asset management program. For many asset intensive services, climate change makes it more difficult to deliver desired levels of service. It amplifies risk and increases costs required to manage these risks. The greatest impacts are to transportation systems, buildings, water management systems, and marine infrastructure. These assets represent the majority of local government infrastructure assets. Climate change will also impact natural assets, which play a critical role in service delivery for all communities. Wetlands, creeks, deltas, foreshore areas, forests, groundwater aquifers, and other natural assets are all vulnerable to the effects of climate change. However, these natural assets can also provide opportunities to increase community resilience to the impacts of climate change and carbon storage to mitigate changing climate. 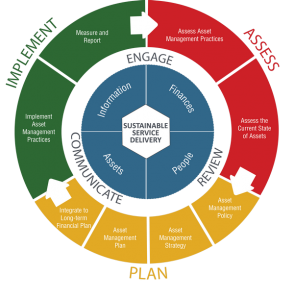 This primer is a companion document to Asset Management for Sustainable Service Delivery, A BC Framework (the Framework) and builds on concepts from the Framework. Thanks for participating in the 2018 Asset Management BC Conference. As a delegate/presenter/sponsor, Asset Management BC would like to solicit your input in order to improve the conference in 2019. Registration is now open for the 2018 Asset Management BC Annual Conference, Competing Priorities in a Changing World, September 26 and 27 at the Radisson Hotel – Vancouver Airport. Learn about practical approaches and solutions for implementing asset management in your community – from integrating climate change into asset management practices to effectively communicating asset management with elected officials. Bob Sandford, Chair for Water And Climate Security at the United Nations University for Water, Environment and Health, is the opening day keynote speaker, followed by Diane Kalen-Sukra, a passionate sustainable community builder, on Thursday, September 27th. Presentations on climate change, risk, levels of service, new asset management tools and communications, as well as a Federal, Provincial, UBCM and FCM panel on funding are all part of an informative 2 day program. *Conference presentations will be posted to the AM BC website by the end of October to allow adequate time for all presentations to be received. The theme of the 2017 Asset Management BC Conference was Asset Management: Scalable – Doable – Achievable. Stay tuned for more information on the 2018 Asset Management BC Conference. The Status of Asset Management in British Columbia: Results from the 2016 Gas Tax Fund Asset Management Baseline Survey is now available. In May 2016, UBCM launched the Phase 1 Asset Management Assessment Form – Baseline Survey collecting responses from all 189 local governments in BC. While each local government provided discrete data, this report describes cumulative data only. Results from the survey are the first of its kind in BC and confirm what was known anecdotally; there is a growing awareness of the importance of asset management to support the long-term delivery of local government services. The MMCD Asset Data Exchange Standard project is complete and standardized files and supporting documentation are ready for download. The standard is build on the MMCD Municipal CAD Standard, with the end result of a single source of infrastructure data submission to the Local Government with physical properties and lifecycle management attributes. For more information and download, see MMCD’s announcement. The MNAI has opened a request for expressions of interest for local governments that would like to submit an application to participate in its next round of projects. For more information on getting involved in the next round of projects and what local governments can expect as a result of participation please read more here. Expressions of Interest are due on Friday, July 14th, 2017. Check out the MNAI discussion paper on Defining and Scoping Municipal Natural Assets.